There is high tension on the Korean peninsula as the US and South Korea carry out military drills, five days after the North shelled an island. Residents of the island - Yeonpyeong - were briefly ordered to shelters on Sunday after new shellfire was heard and Seoul asked journalists to leave. China, the North's ally, has told South Korea's president it will try to prevent the situation deteriorating. Four South Koreans died in the North's shelling of the island. The US-South Korean exercises were planned before the latest crisis and are taking place in the Yellow Sea, about 125km (77 miles) south of the disputed maritime border between the two Koreas, about 40km off the Korean coast. 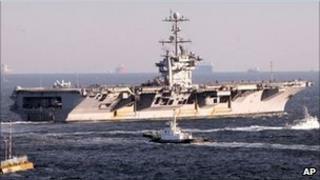 The aircraft carrier the USS George Washington and four other US navy vessels are being joined by South Korean destroyers, patrol vessels, frigates, support ships and anti-submarine aircraft. Shortly after the exercises began, North Korea again vowed to hit back if its waters were violated. "We will deliver a brutal military blow on any provocation which violates our territorial waters," the North's state-controlled KCNA news agency said. The Yonhap news agency reported that Pyongyang had placed surface-to-surface missiles on launch pads in the Yellow Sea and had also moved surface-to-air missiles to frontline areas, but the South's defence ministry could not confirm the deployment. Residents of Yeonpyeong were ordered to shelter in bunkers when artillery fire was heard on Sunday, but the order was lifted 40 minutes later. Only about 20 of the 1,700 residents remain on the island. The South Korean defence ministry has also now instructed journalists to leave by the end of Sunday as it cannot guarantee their safety. "At this stage, it is unpredictable what kind of a provocative action North Korea will take using the South Korean-US joint drills as a justification," the ministry said. The BBC's Chris Hogg in Seoul says diplomatic moves have been stepped up to try to ease the crisis. Senior Chinese foreign policy adviser Dai Bingguo met South Korean President Lee Myung-bak and said Beijing would try to prevent the situation deteriorating any further. Mr Lee had urged China to take what he called a more fair and responsible position on the relationship between the two Koreas. The chairman of North Korea's parliament, an official known to be a close confidant of North Korean leader Kim Jong-il, has been invited to visit Beijing next week. China has also expressed concern about military activity by foreign navies so close to its territory, and has warned the Americans not to stray too close. The crisis began when the North launched a sudden barrage of shells at Yeonpyeong island, close to the maritime border between the two countries, on Tuesday. Two South Korean civilians and two marines were killed, sparking the resignation of the South's defence minister and angry protests in the South. On Saturday, North Korea accused the South of using civilians as human shields on Yeonpyeong island, saying it had used their deaths as "propaganda". Pyongyang insists it was provoked into the shelling by military exercises, which were being carried out by the South close to Yeonpyeong.